I hope everyone had a great weekend. We had a three day long weekend and it was quite refreshing. Nikolai went on a field trip last week to MOSI (Museum of Science & Industry) in Tampa which is about 2-3 hours drive one way from where we are. This was his first trip out of town in a bus and also a trip without us. I was kind of worried and had butterflies in my stomach when I dropped him off at school that morning. Guess I can't help it, being a parent, and I am sure the other parents felt the same too. We have been to MOSI before and there is a life-size dinosaur sculpture called Recyclosaurus Rex at the entrance. It was that shape which inspired these lunches. There are a great many interesting and educational exhibits at MOSI and many are interactive. I would certainly recommend a visit there to anyone visiting the Tampa area. In making this first bento, I used my Wilton animal pals dinosaur shaped cookie cutter for the dinosaur and a palm tree cutter for the tree. Other cutters made the lower dinosaur and the ones cut from watermelon. I also included some slices of cucumber and some grapes with a cute dino pick. 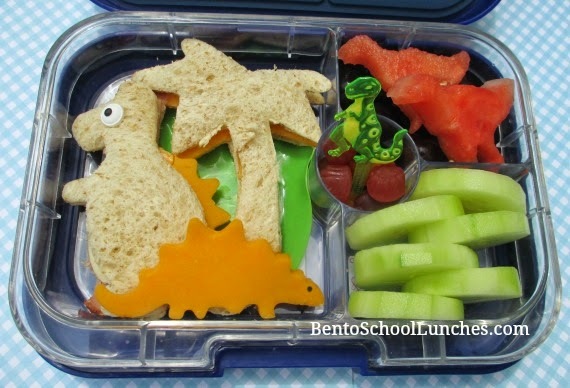 The next dinosaur lunch was created using my dyno sandwich crust cutter which was very easy to use. I've owned this cutter since Nikolai started Kindergarten and it's from one of my earlier collections. I used my alphabet cutter for the letter 'D' on a babybel cheese. He also had strawberry slices, Annie's homegrown organic crackers and crinkle cut cucumber slices. This lunch was packed in a Planetbox Rover. 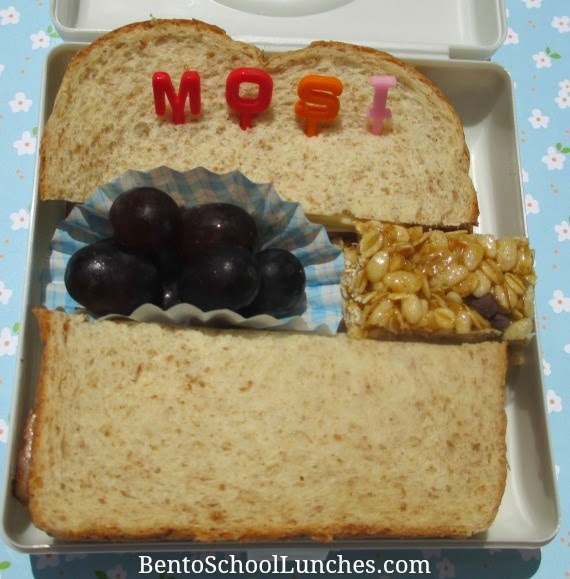 His field trip lunch was very simple; a thick turkey and Gouda cheese sandwich cut into half with MOSI lettering, organic granola bar cut into half and seedless grapes. I also sent him a huge snack box and a couple bottles of water which were not in picture. Fun and cute lunches! My kids love dinos! 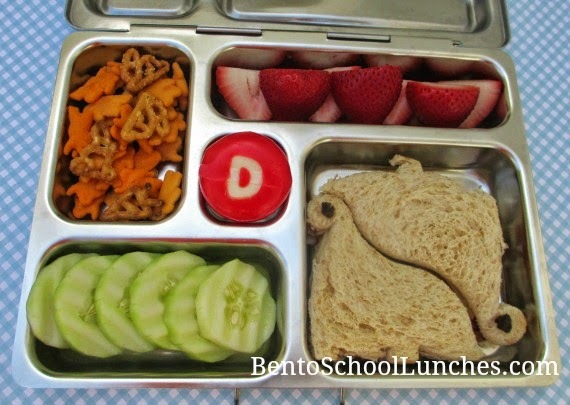 Love those dino bentos! My youngest is crazy over dinosaurs! The dino lunches are so cute! Sounds like such a fun place. Thank you Ming! Yes, it's a fun museum and I'm hoping to visit there again this year. Always love your bentos! Featured this on WKEW - What Kids Eat Wednesdays!